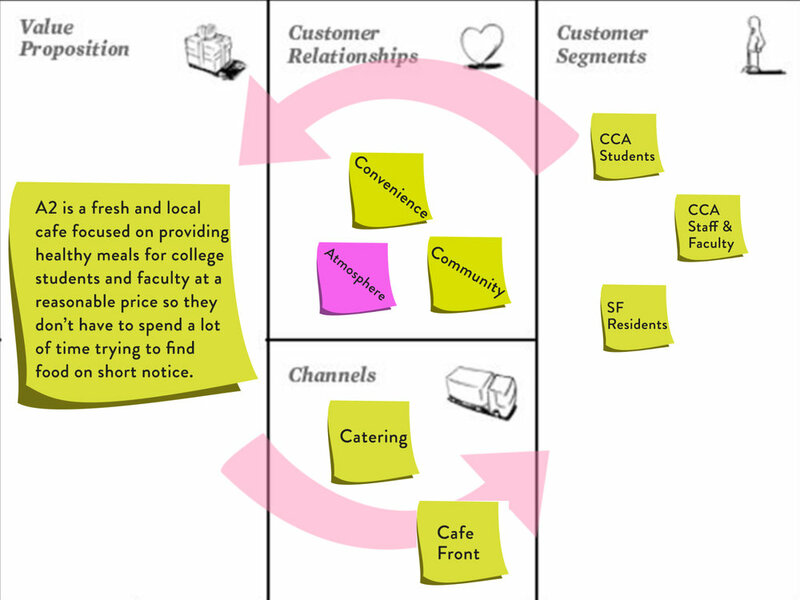 The two-week assignment was to re-design customer experience of the college cafeteria. I collaborated with John Sun, Hongmeng Yang and Andy Shimmin. Over the first week we focused on understanding the customers' experience. We paid attention to the use of time, space and senses. We identified pain points and opportunities. The final outcomes were artifacts of current and future experience. Our advisor was Alexander Baumgardt, Advisor for integrated Brand, Product & Service Experiences. In collaboration with Hongmeng I spent one hour observing the behavior of customers and employers. I took pictures, notes and videos. I conducted interviews with an employee (I was asking questions) and 5 core customers (I was note-taking). The questions were previously prepared by me and Hongmeng. I made an interior architecture layout to understand the behavior of customers. I synthesized collected observations and interviews to find areas of opportunity. The biggest pain points appeared in the space and service areas. Based on the interview with the employee I made a business stakeholder map. I identified internal and directly affected stakeholders. Based on interviews with employees I created a persona. In collaboration with Hongmeng I made the journey Map of Current State to introduce the emotional experience of customers, journey phases, pain points, and opportunities. Together with my teammates I brainstormed the possible solutions, keeping in mind identified opportunities. Keeping in mind customers' and employees' needs, I created the new A2 space with a clear area distinction. I mapped the A2 space excluding the boiler and the existing counter. Now there is enough space for waiting, paying, picking-up and adding condiments. I adjusted tables according to diverse needs. John re-designed the condiments area to provide convenient and quick access. I collaborated with him to make sure that the interior I re-designed provides enough space for this area. We made three things to improve customers experience: We redesigned the layout of cafeteria, improved placement of the condiments and introduced the number system in which the customer receives the number after ordering.